The Amelia Island Florida lighthouse has guided sailing ships to modern freighters and fishing boats safely into the channel toward Fernandina Harbor since 1838. It was constructed using materials taken from the former little Cumberland Island light. Cumberland Island is in Georgia just north of the inlet built in 1820. The best explanation I found for all of this lighthouse moving around stuff was that the US simply did not control of Amelia Island in 1802 at the time the first light was built. 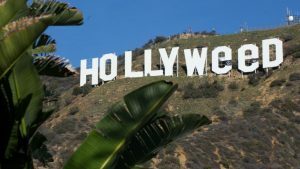 The area became a major black-market home to scores of smugglers, drunkards, and prostitutes that spilled over into the southern states. The US had enough, stepped in and took control of the island in 1819. The Amelia light stands in a tranquil setting on the northernmost barrier island on Florida’s Atlantic coast. It is the state’s oldest lighthouse and is the only one surviving from Florida’s territorial period 1819-1845 without major rebuilding. The brick tower was 50 feet tall. When the lantern was installed it increased the tower height to 64 feet. 21 keepers have been responsible for climbing the tower’s 69 granite steps to attend the light. One keeper, John Miles, who served from 1880 to 1895 had an artificial leg with rubber foot attached. When the light sent its first beam out to sea Florida was not yet state. Since then eight flags have flown over Amelia Island. French, Spanish, English, Patriots, Green Cross of Florida, — had to look this one up. In 1817 a Scottish soldier and adventure, Gregor MacGregor, claimed Amelia Island on behalf of “the brethren of Mexico, Buenos Ayres, New Grenada and Venezuela. I’m from Florida and never heard that one before—the other flags were Mexico, the Confederate States of America, and the United States. The area was also known as home to the largest concentration of pirates in America. Blackbeard, the Lafittes, Calico Jack, Anne Bonnie and Luis Aury. The rich pirate history gives credence to area stories of hidden treasures and ghosts. The Amelia Island light reaches 16 miles out to sea. Its white light flashes every 10 seconds then turns red when covering shoal water in the Nassau sound. Electricity was installed in the tower in the 1930s and the station was automated in 1970. In 2000 the Amelia Island lighthouse was declared surplus and offered to the city of Fernandina Beach and was officially handed over. If you visit look up the current lighthouse historian, Ms. Helen O’Hagan Sintes. She is a direct descendent of the first keeper and lived in the lighthouse as a child. Have you been to this light? Ponce De Leon Inlet Lghthouse. 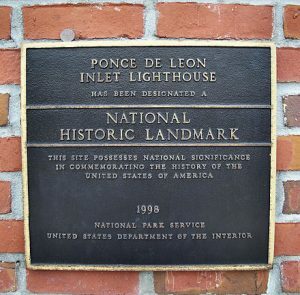 Let’s take a visit to the Ponce De Leon Inlet lighthouse. 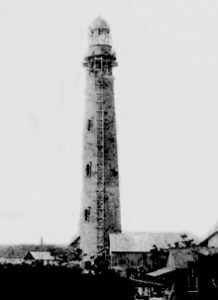 The light is located 10 miles south of Daytona Beach in the town of Ponce Inlet. That’s about an hour’s drive south of me but I’ve never been there. 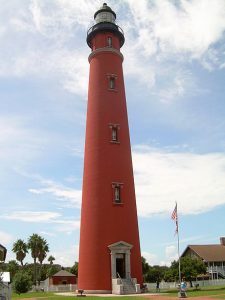 The Ponce Inlet lighthouse is the tallest light in Florida and the second tallest masonry lighthouse in the country second only to the Cape Hatteras lighthouse on the Outer Banks of North Carolina. There are 203 steps to the top of the 175 foot tower situated on the north bank of Ponce Inlet where the Halifax and Indian rivers flow into the Atlantic Ocean. This light, built on 10 acres of land was originally called the Mosquito Inlets Lighthouse. If you’ve visited Florida in summer you probably have no problem figuring out why they called it that. As so many lighthouses do, this tower has some sad history. The chief building engineer and three others drowned in the inlet right after construction began in 1884. Despite this the tower was completed in 1887. 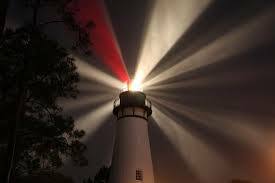 At the time it was said the light could be seen 20 miles to sea. A most definite advantage during the many storms that raked the Florida coast. In the 1920s the lighthouse service added indoor plumbing and bathrooms to the keeper’s buildings. A generator was also installed bringing electricity to the keeper’s home. In 1933 the tower light was electrified with a 500 watt lamp. In 1939 the lighthouse was transferred to the care of the United States Coast Guard. During World War II Coast guardsmen protected the light and stood watch for enemy submarines that cruised the Florida coastline. This light is one of only a handful of 19 century light station to have all its original buildings still intact. 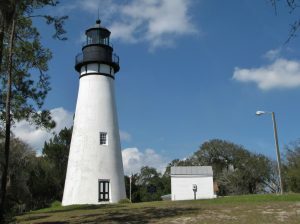 In 1998 the light was designated a national historic landmark. I really do need to get myself in gear and go down and see this light. Have any of you been there?